The Reverend Robert Rutland was Vicar of Christ Church Bengeo for 36 years. 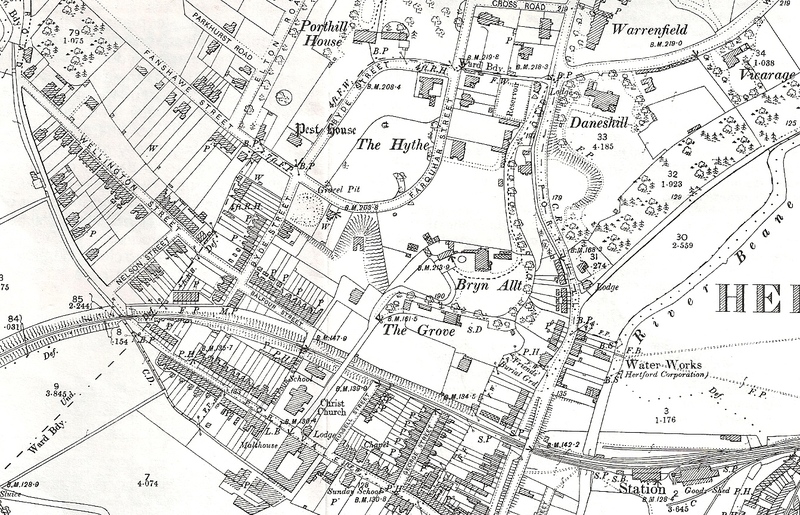 He lived in the vicarage then 3, Warren Park,now known as York House, Warren Park Road. Robert was born in 1825, being christened on 25th May. 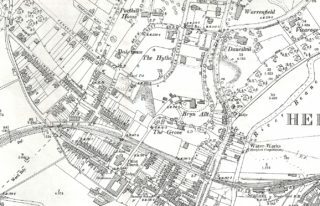 He lived with Joseph, his father, and Mary, his mother in Borough High Street, Southwark which was then in the County of Surrey. In 1857 Robert married Mary Ann Keen in Guildford. They had four children, Robert, Katherine, Herbert and Charles. All the children were born before they came to Bengeo. 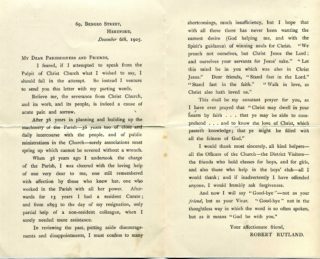 In 1861 Robert was curate of St Mary’s Church, Marylebone. The family lived at 4, Melbury Terrace. 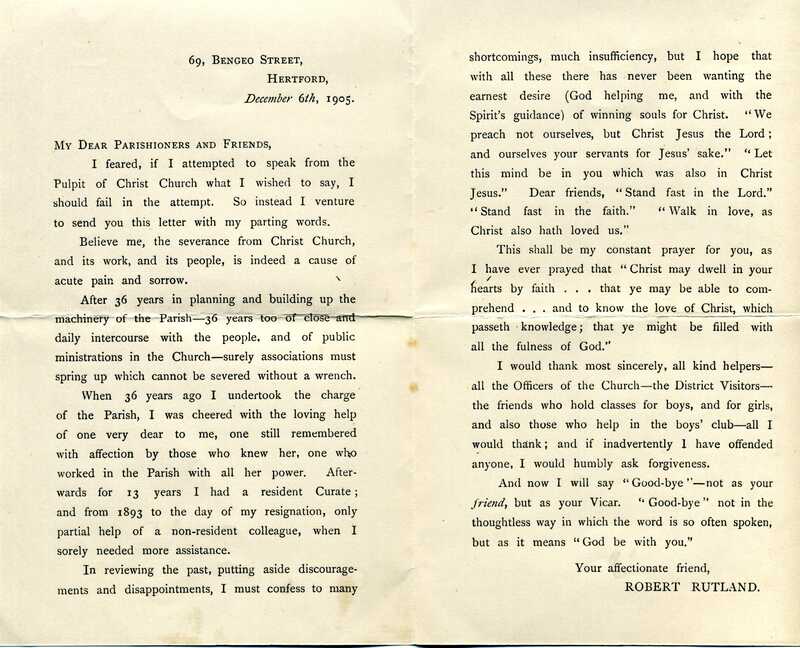 The Reverend Rutland was the vicar of Christ Church from 1869 until his resignation in December 1905, see his resignation letter to the right. Something seems to have upset him whether the continuing sorrow of his wife’s death or something within the parish is not known. Robert died in 1907 and he was buried on 7th March in the churchyard of Holy Trinity, Bengeo. Mary who had predeceased Robert was buried on 17th January, 1897 in the same churchyard. For some reason Mary was not listed as living at the vicarage in the censuses of 1881 and 1891 and she died in Brentford. Her last visit to the Infant School as recorded in the logbook was on 30th May (Ascension day) 1877. Robert was correspondent (i.e. secretary) for the managers of Christ Church Infant School, Port Vale, Bengeo. He was also mentioned as Treasurer of the school in the HMI report of September, 1871. The vicar was only an occasional visitor to the school and then usually either with his wife or daughter Katherine or to record the yearly HMI or Diocesan reports in the logbook. On February 25th 1877 “Rev. R. Rutland visited the school this morning. Examined the Second Class in Arithmetic, Reading and Dictation, found that they had improved the two first named subjects. On a couple of other occasios he took a decision to close the school under exceptional circumstances, e.g. the Prince of wales visit to Hertford. Katherine was a frequent visitor at the school and sometimes heard children read. She died on 14th October, 1942, At the time she was living at Bengeo Nursing Home.